Directly from their website because they said it best: Morsel Spork - it’s part spoon, part fork, part spatula… resulting in the worlds first “Sporkatula”! Probably not the greatest name, which is why they stuck with Morsel Spork, but this little utensil really is all those things. Comes in two different sizes - XL and Mini, which means a long handle or standard handle length. Comes as a spoon only option if you don’t need a fork. Dishwasher safe and boiling water safe. Below is a screen shot from the website describing all the uses of this one utensil! Most of us are familiar with the bags of “instant” food - just add water, wait 10ish minutes, and eat. If you’ve ever enjoyed one of those bags of food on a backpacking or camping trip, then you’re familiar with the struggle to use a normal spoon or fork to get the food out of the bottom of the bag. This is possibly the best feature of the Morsel Spork and the XL’s long handle. It is perfect for eating out of a Mountain House or Good-to-Go food bag. The rubber side of the spoon is great as a spatula to dig out any remaining food off of the edges. The spoon and fork both reach into the deep bag, to get every grain of food! The spoon edge is also a great size for getting an avocado out of the shell. It works for stirring very hot water into the bag or hot coffee, since it is heat resistant. And it’s easy to clean, just toss in the dishwasher when you get home! Great for those fast bag meals, but also great for just having one utensil to serve many purposes at the campsite kitchen! 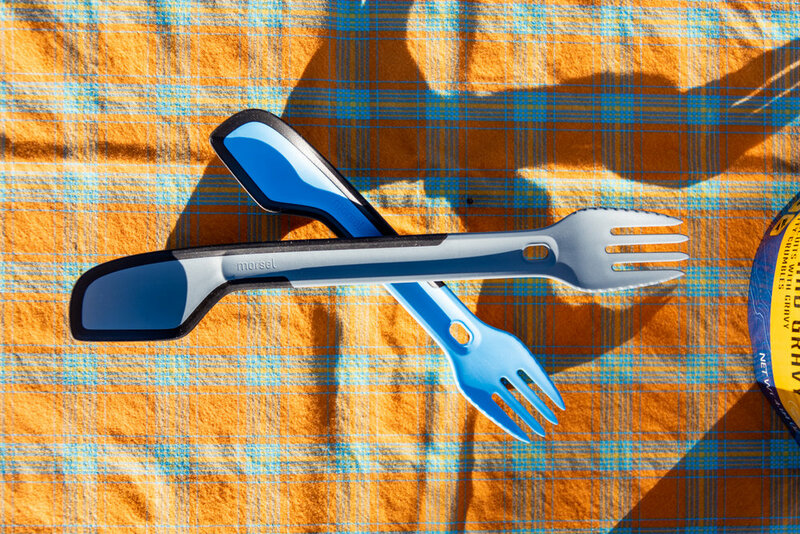 We received the Mini and XL from Morsel Spork to review. We have taken them on multiple camping trips and love them. While we still love some of our other utensils that we’ve gathered over the years, Morsel Spork has won us over for the all around utility and size. Note: Some links on our site are affiliate links. At no cost to you, we will earn a small commission if you choose to make a purchase on an affiliate site. We are grateful for your support of our site in this way. Thank you. Oct 20 Cairn Box Subscription: Totally Worth It!